The parents of two children slain during the 2012 mass shooting at Sandy Hook Elementary School in Newtown, Connecticut, have filed defamation lawsuits against InfoWars founder Alex Jones as well as one of his contributors for fueling conspiracy theories alleging the parents played a role in the massacre that left 26 people dead. Court documents obtained by Gizmodo allege that Jones repeatedly spread malicious claims that the parents were part of a conspiracy to fabricate the “narrative” around the shooting. Two suits were filed in Travis County, Texas, on Tuesday: one filed by Veronique de la Rosa and Leonard Pozner, whose son, Noah Pozner, 6, died in the attack, and another filed by Neil Heslin, who lost his 6-year-old son Jessie Heslin at Sandy Hook. On December 14, 2012, shooting at Sandy Hook Elementary School in Newtown, Connecticut, left 20 young children dead alongside six adult staff members. The gunman, 20-year-old Adam Lanza, also killed his mother prior to carrying out the deadly attack, which remains one of the deadliest mass shootings in United States history. The three plaintiffs are represented by Farrar & Ball attorney Mark Bankston, who filed another lawsuit against Jones and InfoWars last month on behalf of a another individual allegedly smeared by the site in relation to a mass shooting. According to Bankston, these are the first lawsuits he is aware of in which a parent of a mass shooting victim has sued Jones, a notorious purveyor of vapid conspiracies whose main source of revenue is using InfoWars as a vehicle to sell the gullible on snake-oil diet supplements. In the April 22, 2017 broadcast, Mr. Jones next showed video footage of Plaintiff Veronique De La Rosa speaking with Anderson Cooper in her interview. Over this footage, Mr. Jones stated: “And then we’ve got Anderson Cooper, famously, not just with the flowers blowing and a fake, but when he turns, his nose disappears repeatedly because the green-screen isn’t set right. And they don’t like to do live feeds because somebody might run up. CNN did that in the Gulf War and admitted it. Mr. Jones’ assertion that Plaintiff Veronique De La Rosa participated in a faked blue-screen interview from a remote location is manifestly false. Mr. Jones’ assertion that the interview did not take place in front of the Edmond Town Hall is also manifestly false. The visual effect described by Mr. Jones is the result of motion compensation video compression, which would have been readily ascertainable at the time Mr. Jones made his claims. ... Nonetheless, after five years, Mr. Jones continues to push this sick lie about Mrs. De La Rosa and her interview. The second lawsuit claims that Jones and InfoWars contributor Owen Shroyer defamed Heslin by alleging that he lied about holding his son’s body in his hands “with a bullet hole through his head” during a June 2017 interview with NBC’s Megyn Kelly. The underlying point or gist of Shroyer’s report is that Plaintiff’s version “is not possible” and “cannot be accurate,” and that Plaintiff was lying about the circumstances of his son’s tragic death for a nefarious and criminal purpose. In both cases, the plaintiffs are seeking damages “in excess of $1,000,000” for malicious harm to their emotional states and reputations. Brennan Gilmore, a State Department employee, filed a separate suit last month seeking $75,000 in damages. Jones had labeled him a “CIA asset” for filming neo-Nazi James Alex Fields Jr. mowing down people with a car, killing counter-protester Heather Heyer and wounding scores of others, at an infamous white supremacist rally in Charlottesville, Virginia, in 2017. Jones claimed that Gilmore and left-wingers “staged” the attack as part of a conspiracy funded by George Soros, a Jewish billionaire who is a favorite scapegoat of conspiracists. Jones is facing additional lawsuits over workplace harassment and copyright infringement. At the same time, InfoWars’ business model is under assault. 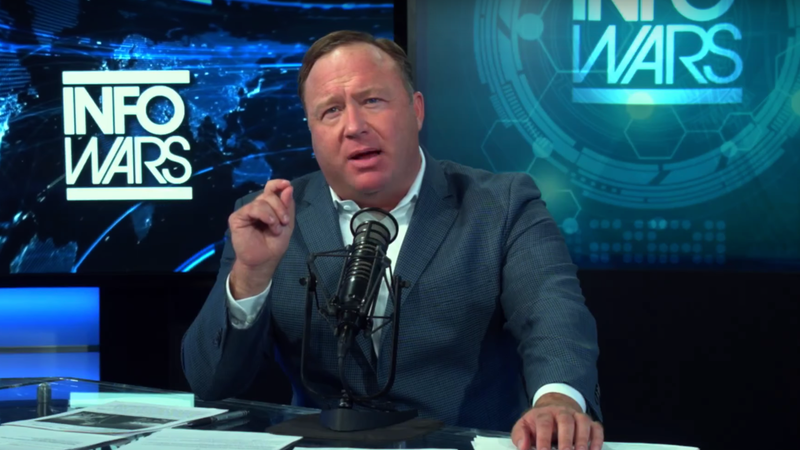 Repeated investigations have found the supplements sold by InfoWars’ store are mostly useless or untested, with some tainted with high levels of lead. The main InfoWars channel on YouTube has also come perilously close to a permanent ban over harassment allegations. It has lost numerous advertisers over his attacks on mass shooting survivors, though YouTube has as of yet declined to terminate it. YouTube did not immediately respond to a request for comment. We’ve reached out to InfoWars for comment and will update this post if we hear back.